I received 8 down votes within a 30 min timespan on answers back to 2010. It seems that either down voters should be revealed or there should be some recompense for trolling for trouble. It is not so much about losing 8 reps. It is more about a rogue user with no check or balance. It is obvious that spending 30 mins to look at the diversity of questions here is not ME making a habit of writing "BAD" answers. But someone researching a single person and nitpicking (in my opinion bullying). None of my answers were the highest rated. And maybe one of them even deserved a downvote in respct to the quality of the answer. (still not my point). Here are the links. compressing map algebra answered Feb 10 2011. Manually reclassify OP didn't specify if they knew what was needed. answered Dec 7 2012.
Business trends OK pretty lame for an answer (plus I didn't ever go find the link). answered Dec 14 2010. Historical rainfall I state that it is not rainfall data but can be correlated to rainfall. 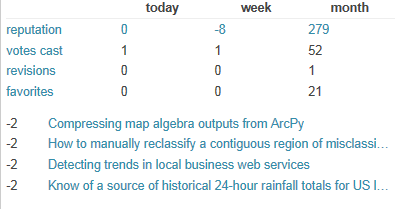 answered Nov 16 2012.
from 23:23 to 23:58 this user was not researching how he could get rainfall data and use it to detect business trends for reclassification using map algebra and arcpy. This type of activity seems to promote the reverse of what this community is about. Following tags is acceptable. Following users is extracuricular. Moderately severe instances of such systematic voting are automatically detected and undone by the SE software. It works both ways: if you have a fan who goes around upvoting lots of your Q's and A's at once, that will be detected and deleted too. In a spirit of finding some constructive outcome to this experience, you might consider interpreting these downvotes as a message (however crudely delivered), think about whether that message might have some validity, and consider whether they indicate some way in which you might be able to improve your answers generally: that's probably the best defense against any such voting in the future. What happened to seeing newest users?